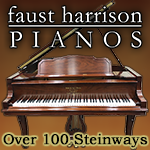 Register Log In Piano World Home Page Forums Piano Forum Starck baby grand from about 1940? My friend is cleaning out her newly deceased mom's home at this time and wants to sell her Starck baby grand ebony piano. I has not been tuned in 12+ years. Her dad purchased the piano 20 years ago "in mint condition" and apparently it has paperword that it has been refurbished. Not sure if this means reconditioned or rebuilt. My technician is going to take a look at it and give her an appraisal. Mean time, is anyone out there familiar with this brand of piano? Yes, but what I know about Starck would not be applicable to your situation. 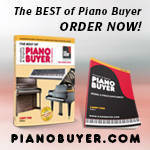 If you have not heard of a particular brand of piano beyond this personal experience, chances are most people have never heard of it at all, and that does not do well when you try to sell it. Thanks BDB! Good common sense there. I appreciate your feedback. 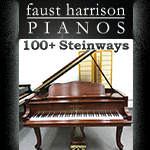 Keep in mind as well that most piano manufacturers were in business quite a while, and what someone may know about a piano from the 1920s or 1960s may not be applicable to a piano from the 1940s. That is why your best bet is just to see what the person who sees it has to say. Thanks again, I just spoke with my tech up here in Granite Bay and he is going to go out and appraise this piano. I snooped around on ebay and just now a Starck baby grand sold for $299, I know, "condition condition condition". Stark pianos are common in Chicago and surrounding areas. The vertical pianos commonly have cracks in the bass bridge at the bridge pins. I'd look for that in the grands as well. Stark grands are a bit rare - I haven't seen too many of them. Stark went out of business in the late 1960's. The quality was average at best, and some (especially stencils made) were below average quality. Plenty of the verticals (usually spinets and consoles survive, though). See what your tech says. Last edited by Bob; 04/21/09 09:45 PM. Thanks so much Bob. I'll post an update here when my tech sees this piano, am curious as to how it has held up as it's quite old and has had "work done". Your best case scenerio is that the piano is from 1965 (44 yo). A more likely case is that it is 75 or 80 yo. Even the best of rebuilds that is now 20+ years old would leave this instrument lacking, especially as it has had now work in over twelve years. 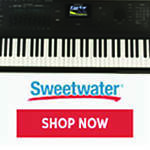 This is not a piano I would consider buying. Retailers on the West coast would sell this for less than $2500.